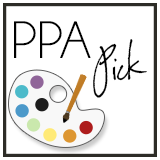 Hello my crafty friends -- have you heard of Paper Pumpkin? 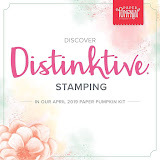 I am sure you have, but for those that have not, it is a Stampin' Up! monthly project kit. It is by subscription only. The best part is that it is a total surprise kit!! The kits include complete instructions, however, if you are like me you don't usually like to follow instructions -- you want to see what else you can do with the selection of goodies. Kind of like those television shows where the chefs are given a group of ingredients to come up with something more fantastic than the other chef contestants. 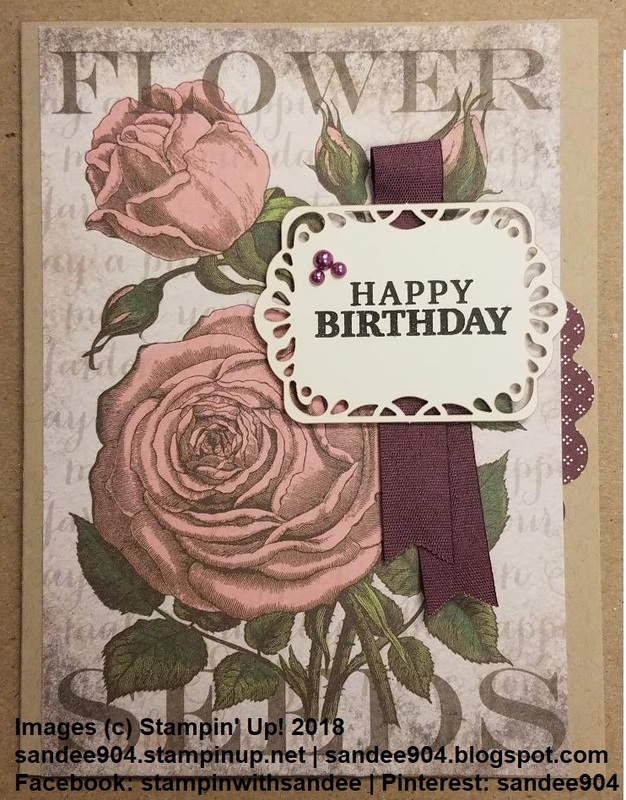 This is the card I made from last month's kit. March was the 5 year anniversary of Paper Pumpkin. 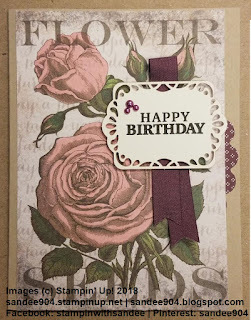 It is a beautiful kit with a flower theme, rose and sentiment stamps with plenty of embellishments and ribbon, and these very cute long, skinny envelopes. I took the envelope, opened it up to cut it down to 5 1/2 × 4 for this cute card front on a crumb cake base. Add the pretty ribbon and embellishments. The lovely Rich Razzleberry scallop piece on the right is the envelope flap! What a cute card. Love it!! I would love to see what you have done with your kits. If you don't subscribe already, here's a great incentive. Special pricing for signing up for Paper Pumpkin between now and May 10. Creativity Starts with Paper Pumpkin -- get 50% off for two straight months. You have to sign up by May 10. Use the code SAVEFIFTY0418. Let me know if you have any questions.